one-to-one teaching as well as group sessions. In groups children are taught without a parent/guardian in the water. We encourage children to play and enjoy themselves in the water. Informal learning and structured play is introduced once the child feels confident in the water. Flotation skills are developed along with body movements, and blowing bubbles encourage aquatic breathing and coordination skills. 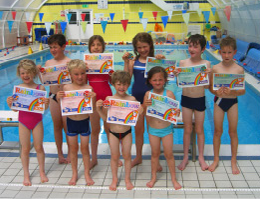 At this age the achievement of distance certificates and badges encourages children and rewards their efforts. We have been coming for many years and it has been constantly good for my two boys. The experience and the teaching technique we have had from MXT has been amazing.